Special Metals current has two welding chambers, used for welding refractory materials. We specialise in the welding of tantalum, tungsten, molybdenum, niobium, zirconium and titanium. Our welding equipment “Miller Syncrowave” is one of the most sought after TIG welders available on the market, capable of welding any of the Refractory metals that are mentioned above to any thickness required. We mainly use this for parts that we manufacture and supply to our customers from their own drawings but are able to offer a “weld only” service for any free issue material that you need welding. These refractory materials, especially tantalum cannot be welded in a normal atmosphere. The vacuum chamber is pumped down to a high vacuum of 10-3Mb and then filled with Argon to create an atmosphere of >5ppm of Oxygen to stop any oxidization occurring, especially in Tantalum which is very susceptible to attack by Oxygen. 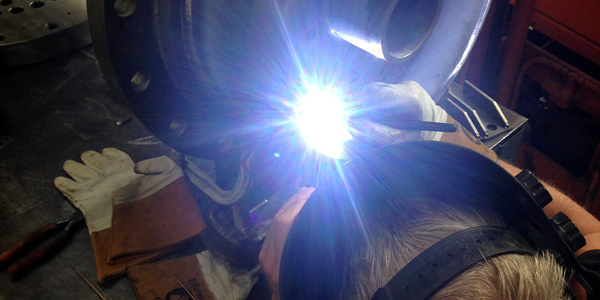 For any enquiries in relation to our welding services, please just give our team a call today!